After the Lancaster stone turnpike was completed in 1794, the increase of travel along it necessitated the erection of many inns in addition to the early ones such as the Spread Eagle at Strafford. Eventually they averaged about one to the mile, especially as the distance from Philadelphia increased, and there was greater need for meals and overnight accommodations. Space does not permit an enumeration of all of them in this column, although several seemingly accurate lists are still in existence. One more, however, should certainly be added to those we described in last week’s column, since it is a nearby one which is still standing and in good condition, a charming reminder of an era long past. Still known today as the Ship Inn, it is situated on the Lincoln Highway, one mile east of Exton, catering now to the automobile tourist, as in olden days it catered to the stage coach passenger. This old Inn as it now stands was built in 1796 by one John Bowen, who brought the signboard from an even older Inn which flourished on the Kings’ Highway west of Downingtown in Revolutionary days. The first Inn was operated by a Tory, as were many others of that time. To quote from the interesting little brochure issued by the present proprietor of the Ship Inn, “Several days after the battle of the Brandywine a company of American soldiers stopped at the Inn for refreshment, but the old Tory flew into a rage and ordered them away. To punish him, the soldiers put the ‘Patriots’ curse’ on the Inn by firing thirteen bullets through its sign. The curse was apparently potent, for the original Ship Inn was soon out o*********** f business.” This signboard was later taken to the new location of the “Ship Inn”, where for many years it swung and creaked in its yoke by the roadside. From these figures it is not difficult to estimate the modest cost of the Ship Inn which remains to this day such a charming landmark on the old highway. This tale of the old signboard, into which the soldiers shot thirteen holes, calls to mind stories of two others Inns in the close vicinity of the Spread Eagle. They were told to me by Miss Lecian Von Bernuth, who is well versed in the history of Strafford, where she makes her home. It seems that in Revolutionary days there was another Inn almost opposite the Spread Eagle. Some English soldiers were quartered at the former, while at the latter there were a few from the American army. At various times they are said to have made forays into each other’s premises, sometimes even meeting in the middle of the road for a skirmish. The little old stone house standing even to this day just to the west of the present Spread Eagle Mansion was once a roadhouse where men from the American forces were stationed. The big oak still standing in the field back of this building is said to have been a lookout towards Valley Forge. Up until a comparatively short time ago the old bar was still in the small building as was the trap door that on occasion plunged undesirable patrons into the basement! As the Inn guests looked over the rail of the cool, shaded second floor porch they might see long lines of Conestoga wagons going either to the East or the West. These wagons were usually drawn by “five stout horses, each horse having on its collar a set of bells consisting of different tones, which made very singular music as the team trudged along at about the rate of four miles an hour” or there might be companies of emigrants traveling together for mutual assistance towards the new West, there to found homes of their own. Large herds of cattle or flocks of geese also added to the panorama. In 1823 there were eleven principal lines of “Land Stages” running daily East and West on the turnpike past the Spread Eagle. Among them were the quaint names of “Harrisburg Coachee”, “Lancaster Coachee”, “Lancaster Accommodation”, “Harrisburg Stage”, “Lancaster and Pittsburgh Mail” and others. The fare for way passengers was usually six cents a mile. Through fare from Philadelphia to Pittsburgh was $18.50 each way, meals and lodgings extra. The “Coachee” here mentioned is described as a carriage peculiar to America, with the body rather longer than that of a coach, but of much the same shape. In the front “it was left open down to the bottom, and the driver sat on a bench under the roof of the carriage. There were two seats in it for passengers, who sat with their faces towards the horses. The roof was supported by posts at the corners, on each side of the doors, above the panels; it was open and to guard against bad weather there were curtains made to let down from the roof and fasten to buttons placed for the purpose on the outside. There was also a leather curtain to hang occasionally, between the driver and the passengers. The Coachee had doors at the side, since the panels and body were generally finely finished and varnished”. 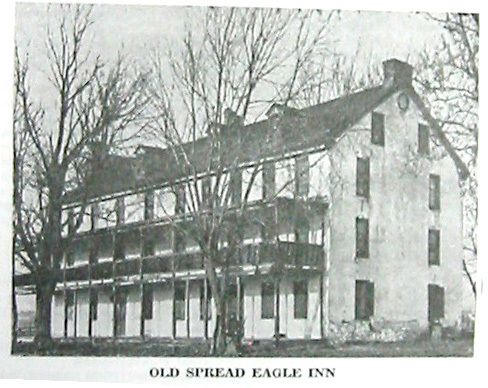 In the April 21 and April 28 issues of The Suburban this column described the first Spread Eagle Inn on the Lancaster Highway, which was “kept as a house of entertainment by one Adam Ramsower as early as 1769”. This quaint little building which J. F. Sachse, in his book, “Wayside Inns on the Lancaster Turnpike”, speaks of as “a small rude stone house” was replaced in 1796 by the large three-story stone building with porch and piazza extending along the entire front, which is shown in the picture accompanying this article. Built a year or so after the completion of the first stone turnpike in the United States, this lovely old inn stood slightly to the West of the present building now known as Spread Eagle and occupied by the A. L. Diament Company, Interior Decorators, on the first floor and by apartments above. Among the early owners of the Spread Eagle were Adam Siter and John Siter. The new tavern was built during the ownership of the latter, who was succeeded by Edward Siter. During the late years of the eighteenth century, the little hamlet which grew up around the Inn was known as Sitersville on all the local maps. Even a post office was located here, the importance of which is shown by old records of the United States postal department for the years ending March 31, 1827. These records show that there was a larger amount of postage collection there than at any other tavern post office on the turnpike east of Downingtown, viz: $60.25. During the same period the collections at “The Paoli” were but $6.54! Other members of this same Siter family later became extensive landowners of Wayne. William Siter, the grandfather of Mrs. Emily Siter Welcome and George M. Siter, who now live on West Wayne avenue, owned what is at present the Mill Dam property, in addition to many other acres in that general vicinity. The family had much to do with the First Baptist Church which with the old cemetery with its quaint markers still stands as a reminder of days long past. Before the time when inns like the Spread Eagle became frequent along the highway, travelers secured entertainment at private houses. An early historian, John Galt, writing in 1738, tells us that in the houses of the principal families in the county, “unlimited hospitality formed a part of their regular economy . . . It was the custom of those who resided near the highways, after supper and the religious exercises of the evening, to make a large fire in the hall, and to set out a table with refreshment for such travellers as might have occasion to pass during the night. And when the families assembled in the morning they seldom found their tables had been unvisited.” Inns as they became more and more the order of the day were havens for the weary sojourner in need of rest and refreshment whether “he were farmer, drover, teamster or traveller upon business or pleasure bent”. These taverns became important landmarks in both social and political history, growing, according to Mr. Sachse, “in the course of years from the lowly log tavern, to the stately stone turnpike inn of later years, in which important social functions were held”. In some instances they were also polling places and provided assembly rooms for Masonic Lodges and similar organizations as well as for mass meetings and political rallies. “Meals at these inns such as the Spread and the Warren presided over by the Pennsylvania-German matron” to quote Mr. Sachse again, “were entirely different from the fare set out in the houses kept by other nationalities. When in the other wayside inns, even of the better sort, regular fare consisted of fried ham, corned beef and cabbage, mutton and beef stews, mush and molasses, bread, half rye and corn meal, with occasional rump steak and cold meats and tea . . . in these Pennsylvania-German inns we had such dishes as “Kalbskpf” (mock turtle) soup redolent with the odor of Madeirs; ‘Sauerbraten’, a favorite dish of the Fatherland; ‘Schmor braten’ (beef a la mode); ‘Spanferkel’ (sucking pig stuffed and roasted); ‘Kalbsbraten’ (roast veal filled); ‘Hammelsbraten’ (roast mutton); ‘Kuttleflech’ (soused tripe spiced); ‘Hinkel pie’ (chicken pot pie); ‘Apfellose’ (apple dumpling); ‘Bratwurst’ (sausage); applecake, coffee cake with its coating of butter, sugar and cinnamon, and many other dishes unknown to their English competitors”. Sharply defined lines were drawn between the various classes of wayside taverns. Those of the better class, such as the Spread Eagle were known as “Stage stands” when stage coach passengers stopped for meals and sometimes for the night. Here also relays were changed. “Wagon stands”, those taverns patronized by wagoners and teamsters were next in the scale. Often their sleeping quarters were on the floor of the barroom or barn on bags of hay. “Drove stands” made up another class where special accommodations were to be had by the drovers for their cattle, which were here watered, fed or pastured. The lowest class of all was the “tap house” the chief income of which came from the sale of bad spirits or whiskey. Distances between places were computed from inn to inn, as shown by some of the old provincial almanacs which have still been preserved. Since but few of the teamsters or wagoners could read, the signboards which swung and creaked in their yokes were all figurative. Some were even painted by artists of note. The reason for the figurative feature was two-fold; first, they were more ornate, and second, they could be understood better by travellers of different nationalities. Many of the signs were of a homely character, such as “The Hat”, “The Boar”, “The Lion”, and “The Cat”. The drove stands usually had signs pertinent to their class of patrons, such as “The Bull’s Head”, and “The Ram’s Head”, while tap houses were known by such designations as “The Jolly Irishman” and “The Fiddler”. The best class of stage stands had such names as “The King of Prussia”, “General Paoli” and “Spread Eagle”, to name but a few in this vicinity. Sometimes political changes caused changes of names. One of the most noted taverns on the Lancaster turnpike, the “Admiral Warren”, after the Revolution, had the coat on the figure on its signboard changed from red to blue, and henceforth it was known as “The General Warren” in honor of the hero of Bunker Hill. Among the many old taverns along the Philadelphia and Lancaster Turnpike, in addition to our own “Spread Eagle”, few are better known to the present generation than the “Red Lion”, still a familiar landmark in Ardmore. Also in Lower Merion were “The Black Horse Tavern” just over city line, about one mile east of the old Friends Merion Meeting house and “The Seven Stars”, kept for many years by the Kugler family. The Buck Tavern was between Haverford and Bryn Mawr, a stage stand of the first order and renowned for its good cheer. In Radnor Township there was “The Plough” and “The Sorrel Horse”, the latter still remembered by many in the community. “The Spring House” was just east of Reeseville, now Berwyn, while a nearby Inn was known as “The Drove Tavern”. “The Paoli” was among the most celebrated stage stands. Destroyed by fire in the 1860’s it had been the polling place for several townships and the chief post office for the district. The small house built by a Welshman named Lavis in about 1648 with the acreage around it, which is now the home of Miss Emily Exley, on Radnor State road, remained in the Lavis family until 1702. In that year it was sold to John Davis, a silversmith residing in Philadelphia, where he had owned his own small shop. From that life to one of a hard-working farmer on the edge of Chester Valley must indeed have been a change to the new owner of this property. The town from which he came was then but twenty years old, having been laid out in 1682 by Captain Markham and a small company who had been sent there the year previous by William Penn. In 1683 it was reinforced by a company of Germans, who upon Penn’s suggestion, settled a few miles up the Schuylkill River at what was later known as Germantown. By 1685 the Philadelphia settlement was in a thriving condition with about 200 buildings and some 2400 inhabitants, largely Quakers, with Germans second in numerical strength. Such faith did Penn have in his “City of Brotherly Love” that he delegated to the inhabitants more privileges and powers than the colonists possessed in any other colony. Absolute religious freedom was the most important and, for those times, the most remarkable concession. All Christians holding certain amounts of property were to be eligible voters and officeholders. Soon after Penn’s arrival in the Colony in 1682 an assembly held at Upland formally adopted Penn’s plan of government. In 1683 Penn made his “Great Treaty” with the Indians, an agreement that preserved Pennsylvania from Indian hostilities during Penn’s lifetime. John Davis, silversmith, left this rapidly growing community on the Schuylkill to become a farmer on the land formerly owned by the Welsh family of Lavis. John Davis and his family owned the land for thirty-four years. In 1736, Thomas Davis, John’s son, sold the family holdings to Isaac Walker. The latter not only farmed the land, but built a grist mill for which he had found there was great demand. As a source of power he used the stream that now runs between the house and the road. In the first century after the settlement of Pennsylvania the comparatively simple needs of its people were supplied by individual artisans among them. Along the stream mills driven by the weight and mountain of falling water sawed the logs, ground the flour and fueled the woven cloth. After a few years of farming and of running his mill Isaac Walker sold his holdings to Philip Eillers, who greatly developed and improved the original small grist mill. It is more than likely that Eillers himself ground corn for the soldiers of the American Army during the Revolutionary War. For certain it is that many of their members were encamped almost in sight of the Eillers place during the dreadful winter of 1777-78, when Washington held his cold and hungry troops together at Valley Forge, preparatory to his march on Philadelphia. Originally the Lavis homestead had consisted of one hundred and seventeen acres. This was kept intact until 1784, when one Benjamin Jones “lawfully seized” fifty-seven acres from Phillip Eillers. It is not known what claim he laid to the land, as it is not recorded in the deeds. It is possible, however, that he was some relation to Isaac Walker, Philip Eillers’ predecessor. The log cabin and the grist mill were included in the fifty-seven acres. When Benjamin Jones died in 1815, he left provisions in his will for thirty-six acres to be sold by his executors. In carrying out his instructions they sold two acres to a Richard Sands. When they were about to sell the rest a Charles Jones lawfully claimed the remaining thirty-four acres by proving that he was a son of Benjamin Jones. Perhaps the latter had good reason not to include Charles in his will, for it was only five years before Charles was in debt to such an extent that he forfeited the whole property to John Mitchell. The latter took the case to the Court of Common Pleas of Montgomery County. Strangely enough, however, John Mitchell and his wife, Mary, had no use for the land after it had been awarded them. For a year later, in 1821, they sold it to James Bard Patterson. In 1823 Richard Sands also sold his acreage to Patterson, who had now bought most of the land around the grist mill, including the miller’s house and the grist mill itself. This mill was immediately converted into a small woolen factory, making use of the same mill race that had been utilized to run the mill. With his wife Matilda, James Patterson ran the woolen mill for twenty years. When the latter retired in 1841, he sold the whole property to Richard Martin and his wife Hannah, who operated the mill very successfully until some time between 1860 and 1870. In 1871 Martin died, leaving his wife a widow for ten years. When she died in 1881 the seven Martin children inherited the land. Upon Mr. Martin’s death the old woolen factory had fallen into disuse. Eight acres were sold in 1882 by the heirs to the second oldest brother, William Martin. After that the rest of the land was divided into two lots, the one containing the log cabin being sold in 1883 to William B. Morris and Jacob Morris. The latter had bought the land as a lumber speculation. When in 1898 Jacob Morris died, his portion was sold to Phoebe Morris. When the lumber was exhausted the land was divided into three farms. When William Morris died in 1914 a number of close relatives inherited his property. The other lot of land to be sold by Richard Martin’s children went ot the Lincoln Institution in 1885. This indian school used the woodland as a camp for their boys in summer. In 1922, heirs of William Morris divided their holdings into three portions, two of which were bought by Miss Emily Exley and the other by Hy Gage, of Philadelphia. He in turn sold to Miss Peacock. The additions Miss Exley made to the humble little cottage of 1648 were described in last week’s column. 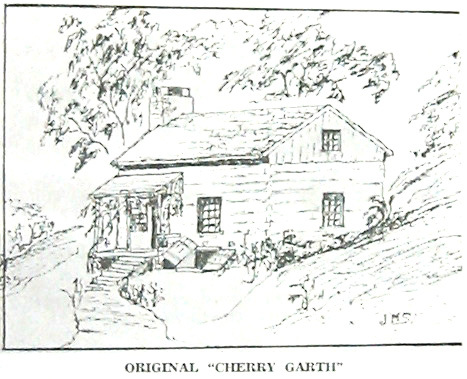 Suffice to say that they have been built in such a way as to harmonize with the original small home which Miss Exley has kept almost intact and which she calls “Cherry Garth” (Garth meaning an enclosure). The illustration used with this article shows the charm of the whole structure. Seldom open to the public, Saturday afternoon (May 13) affords an opportunity to everyone who is interested to see the house and the gardens which will be open to the public at a Garden Fete and Country Fair to be held for the benefit of the anniversary fund of the Women’s Medical College of Pennsylvania, under the auspices of the Soroptimist Club of the Main Line. In case of rain this affair will be postponed to May 20. 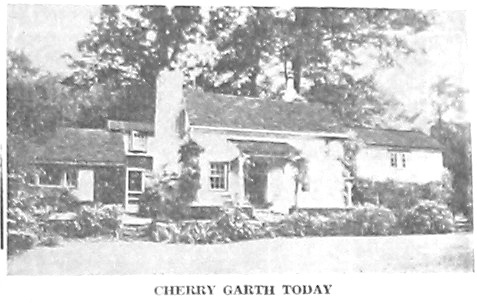 Few among us who are driving from Wayne toward Chester Valley along Radnor State Road (route 252) fail to notice the lovely white cottage known as “Cherry Garth”, set as it is against a woodland background, with a small stream cascading its way between house and road. But perhaps not many outside Miss Emily Exley’s wide circle of friends know that the two-room log cabin, which forms the nucleus of her home, dates back some thirty years before William Penn received the grant of land, from Charles II of England, which was later to become the great state of Pennsylvania. Built about 1648 by an early Welsh settler, the original log cabin consisted of two rooms, with a large open fireplace in the Northern room. Through the years that ensued, ownership of the log cabin changed many times. But it was never without its occupants, none of whom altered greatly either its exterior or its interior. In 1922, when the house with some of the surrounding acreage was purchased by Miss Exley, she kept the original structure almost intact, gaining larger living quarters only by the addition of two wings, each constructed in harmony with the simplicity of the little home built almost three hundred years earlier. Though there are no pictures of this first little log cabin, it must have looked very much as it is shown in the sketch made by Jean Stineman, of St. Davids, which is reproduced with this article. Four years after her original purchase, Miss Exley bought additional acreage which had at one time been the woodland which the Lincoln Institute had used for their Summer Camp for Indian boys. Additions to the house were all built from wood from trees on the place, while stones came from the tumbled-down ruins of the old grist mill which was built in the early years of the eighteenth century and operated with the stream as a source of power. The lovely gardens now surrounding the house are planted almost entirely with flowers and shrubbery native to this section of the country. The man who first cleared the land and built the small cabin which was to endure for so many years was a Welshman named Lavis, in whose family possession it remained until 1702, when one of his descendants, David Lavis, sold the property to John Davis, of Philadelphia. The original Lavis must have made his way by Indian trails to the spot where he built the home for his family from materials near at hand. Very quaint and interesting to the eyes of the present day observers are the unevenly spaced windows, the floors at different levels, with some of the ceilings higher at one end of the room than at the other. All beams are hand hewn. Five years before Lavis built his small home, white men made their first permanent settlement in what is now Pennsylvania when Swedes and Finns came to Tinicum Island on the Delaware River. This was in 1643, and so rapidly did the colony grow that by 1645 there were not only houses, but a church in Tinicum. Pennsylvania differed from all other early American colonies in that many settlements were made within her borders and many races contributed to her people. Its written history begins with the chronicles of Captain John Smith, of Virginia, who in 1608 sailed up Chesapeake Bay to its head and then two miles further up the Susquehanna River until his small craft was stopped by rocks. <	In 1609 Henry Hudson sailed from Holland on the “Half Moon” and entered what is now known as Delaware Bay when he cast anchor. After he had reported back to his native country on a land rich in furs, the Dutch immediately claimed the section which Hudson had visited. The Dutch West India Company was chartered by the Dutch Government. Later the Swedes disrupted their rights, naming a large tract of land on both sides of the Delaware River “New Sweden.” In 1644 two Swedish vessels reached New Sweden. A third came in 1646 and a fourth in 1648, the year in which the Welshman Lavis was building his log cabin. In 1664 Dutch and Swedish dominion was ended forever by the advent of the English. In 1680 William Penn petitioned King Charles II for a grant of land for houses for Quakers who were undergoing persecution in England. His petition was granted with the gift of a large tract of land which its owner named “Penn’s Woods” or Pennsylvania. This, in brief, is the history of this great state in the time when Lavis and his immediate descendants were cultivating the land around the small log cabin on the outskirts of what is now Chester Valley. If Lavis had any of his own countrymen as close neighbors, there is no record of it. It is much more lively that those with whom he came in contact most frequently were the Indians who occupied the fertile lands of Pennsylvania before encroaching white settlers drove them farther West. Only two tribes lived in this part of the country at that time – the Algonquin tribe along the Delaware River and the Iroquois tribes along the Susquehanna and the Ohio rivers. These were the hunters and the fishermen, the wonderful woodsmen whom the English and French first met. On the whole they were a peaceful lot, among whom war was not frequent before the advent of the White Men. Strange as it may seem, North America has never been as thoroughly a country of farmers as it was before the coming of the white men to its shores. Though agricultural implements were of the crudest character, sometimes merely a stone or a shell, or even a bone attached to a piece of wood, their crops were varied and plentiful. Corn, tobacco, beans, squashes, pumpkins, sweet potatoes, peanuts, gourds, sunflowers and cotton were raised by many of the tribes, with the work done mostly by the women. Some of these same crops may have been among those that the Welshman Lavis raised.